Neymar scored a penalty as Paris St-Germain beat Amiens 2-0 to reach the French League Cup semi-finals. The Brazilian has now scored on his PSG debut in all four competitions – Ligue 1, the Champions League, the French Cup and the French League Cup, which PSG have won four years in a row. Amiens keeper Regis Gurtner was sent off for fouling Kylian Mbappe. 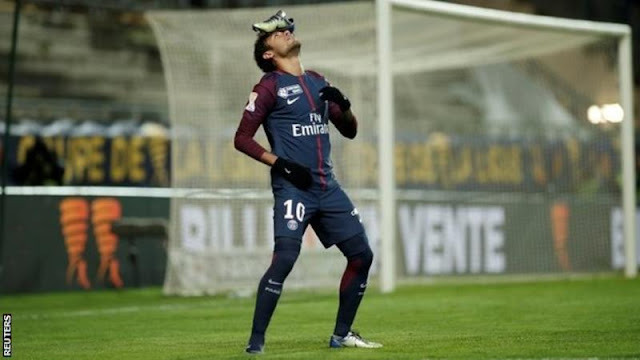 Neymar opened the scoring after he was fouled by Thomas Monconduit, and Adrien Rabiot headed in the second goal. PSG have not lost in 35 domestic cup ties over almost four years, winning the past three French Cups in addition to their string of League Cup triumphs. They face Rennes in the semi-final, with Monaco playing Montpellier in the other tie. Unai Emery again left out PSG’s Urugayan top scorer Edinson Cavani, who returned to the French capital late from his winter break.